Why would you need a gallbladder ultrasound? If you have pain under the ribs in the right side of the stomach. Sometimes it is in the back, under the shoulder blade on the right side. You can't get comfortable or unable to take deep breaths. The pain can wake you at night, or it may occur after meals. There are many other reasons for pain. It could be a Heart attack, see Heart ultrasound or liver ultrasound , flu, food poisoning, gallstones, blockages, or it could be as simple as gas. The important thing is if it persists, see your doctor soon. What does the gallbladder do? Found just under the liver, it is a small sac that stores bile to help digest fats. 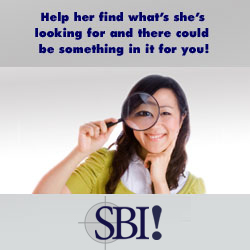 Besides ultrasound, there are other ways to detect problems. There are liver function tests that can show disease, check amylase or lipase levels which are made in the pancreas. A complete blood count to make sure the white and red cells are at proper levels. X-Rays, MRI and CT scans are also used. 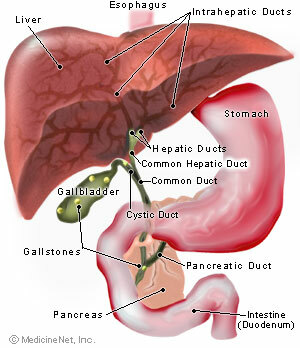 When a gallstone blocks a bile duct, it can cause a lot of pain. You may experience fever and chills or your skin or eyes may have a yellowish tint. These may be signs of an infection in your gallbladder or pancreas ( Pancreatitis ). How are gallstones created? They occur when cholesterol does not drain out of the gallbladder properly or if a person is trying to lose weight quickly. 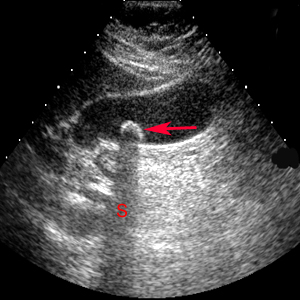 A gallbladder ultrasound may not show all the problems that could happen to one's chest and other tests may be ordered, but ultrasound is the least invasive. When you go in for an exam, you will need to wear a hospital gown. They will most likely want you to drink several glasses of water to have a full bladder. A gel is placed over the area of inspection and they place a ultrasound transducer on the skin. It will transmit soundwaves at a very high frequency into the body and the echos received back will make the basis for the ultrasound pictures. For more on how to prepare for an exam see ultrasound procedures. You could detect a life threatening illness or you may find out something that is easily treatable, giving you peace of mind. Machines are getting smaller all the time. We are going to see phones that can do gallbladder ultrasound , check the ultrasound smartphone. Need to make extra money? Why not get paid to direct people to a site to buy things that they are looking for anyway. Illustration by Medicine Net, Inc.